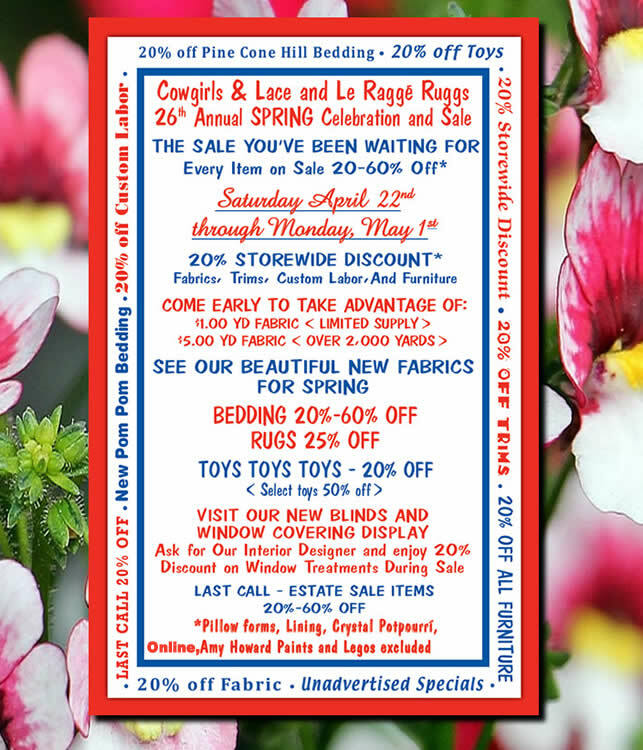 The 26th Annual Spring Celebration and Sale is happening April 22nd to May 1st at Cowgirls & Lace, in Dripping Springs. We want to show our appreciation and thank our loyal customers over the years! so you don’t need to be present to win and we can arrange pickup. Come early to take advantage of the “Limited Supply” of fabric. Choose from over 40 different fabric patterns at $1.00 per yard and over 55 different patterns priced at $5.00 yard. We also have beautiful NEW spring fabrics that came in this month. talk with our Interior Designer about Window Treatments during the sale. Ask about Custom Labor & Trims discounts and the Unadvertised Specials. Last Call on Estate Sale Items, up to 60% off. Certain toys are 50% off. Come see our selection of Pine Cone Hill and Pom Pom Bedding brands. * Pillow Forms, Lining, Crystal Potpourri, Amy Howard Paints, Legos, and online orders are the ONLY items excluded from the sale.